FDG PET/CT detects benign neurofibromas presenting as nodal masses: Imaging hallmarks of a diagnostic "red herring"
Multi-modality positron emission tomography/computed tomography (PET/CT) with 18F-fluoro-deoxy-glucose (FDG) depicts the enhancement pattern and metabolic intensity of lesions. Benign lesions with multiplicity, like neurofibromas often mimic similar appearing malignant neoplasms. 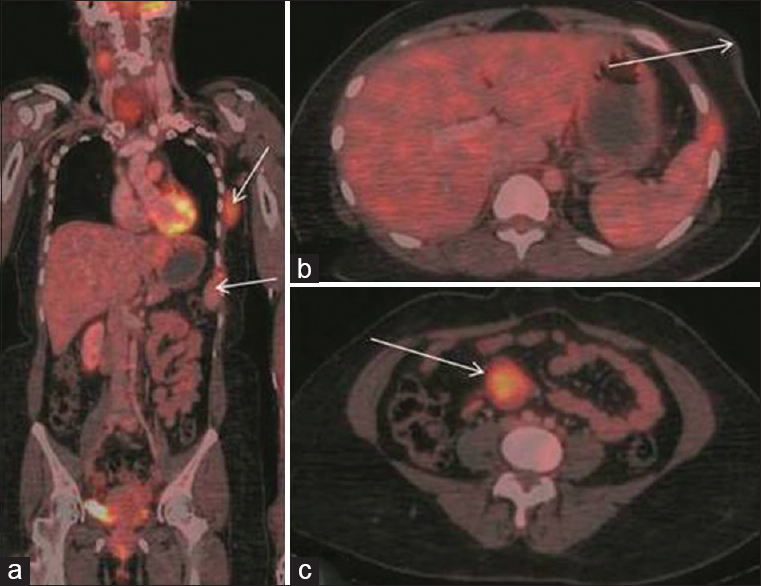 We, report, a similar case where FDG PET/CT shows imaging hallmarks for diagnosing benign neurofibromas, in a patient with clinical presentation of lymphoma. Benign lesions like neurofibromas often mimic similar appearing malignant neoplasms. We report a similar case of a 33-year-old female with clinical presentation suggestive of lymphomatous involvement; highlighting the scan findings on fluoro-deoxy-glucose (FDG) positron emission tomography/computed tomography (PET/CT), which led to the diagnosis of benign neurofibromas. A 33-year-old female presented with large right sided neck and axillary swellings. She was otherwise asymptomatic with no relevant family history. Biopsy at the primary care center was suggestive of dense lymphocytic infiltration. With a high suspicion of lymphoma, she was referred to our tertiary care centre for further management. Whole body 18F-FDG PET/CECT (Contrast enhanced CT) study was performed for staging. Maximum intensity projection (MIP) image showed multiple areas of increased tracer uptake in neck, thorax, and abdomen [[Figure 1]a, arrows]. Axial CT [Figure 1]b and c and fused PET/CT [Figure 1]d and e images showed bulky nonenhancing masses in right cervical level II, anterior mediastinal and left axillary regions. A discrete mass was also seen in left breast parenchyma [[Figure 1]c and e - arrowheads]. Multiple cutaneous, subcutaneous, and mesenteric lesions [Figure 2]a-c were seen on fused coronal [[Figure 2]a - arrow] and axial [[Figure 2]b and c - arrows] images. All these lesions showed low grade intensity of FDG uptake, with maximum standardised uptake values (max SUV) ranging from 2.1 to 3.2. CT showed well-defined, non-enhancing, low attenuation masses. 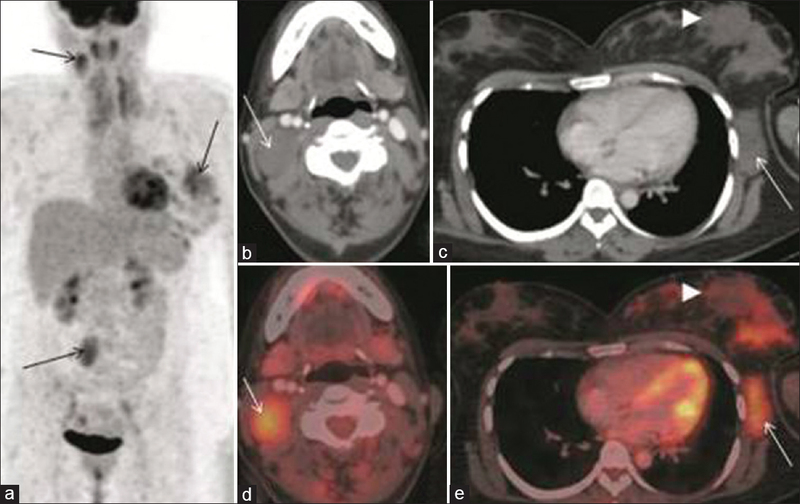 Imaging features on PET and CT were not classical for lymphomatous involvement. Since, enhancement pattern and metabolic intensity were strongly suspicious for presence of benign masses, repeat biopsy was performed from cervical and axillary nodal masses. Biopsy core [Figure 3]a - hematoxylin and eosin stain, ×100)] showed a pauci-cellular spindle cell tumor with myxoid stroma. On immunohistochemistry [Figure 3]b, tumor cells were strongly positive for S100, weak positive for smooth muscle actin, (SMA) and negative for epithelial membrane antigen (EMA) and desmin. This confirmed the presence of a benign peripheral nerve sheath tumor, consistent with neurofibroma. Neurofibromas arise from Schwann cells and fibroblasts. They are commonly found in the neck and thorax, essentially due to the rich network of peripheral nerves in this region. These are commonly seen as round or elliptical, well defined paravertebral masses along the vagus, phrenic and intercostal nerves. Characteristically, these benign tumors show low grade FDG concentration, due to low cellularity and presence of lipid laden Schwann cells. CT shows low attenuation well-defined masses; low attenuation is due to cystic degeneration, xanthomatous features and confluent areas of hypocellularity. FDG PET/CT has also been used to detect transformation of benign neurofibromas to malignant peripheral nerve sheath tumors (MPNSTs), especially in patients with neurofibromatosis type 1 (NF-1). Ferner et al., showed that max SUV in 100 patients with MPNSTs ranged from 3.9 to 7.7; however, there was considerable false positivity, as three benign lesions showed max SUV greater than 3.5. Clinically, symptoms of malignant change are not different from those of benign neurofibromas; hence prediction of malignant transformation is even more challenging, hence, in spite of false positivity, PET/CT has reasonable sensitivity and can guide biopsy in suspicion of malignant change. Thus, in clinically challenging situation like ours, metabolic and morphological signature of lesions on FDG PET/CT help in diagnosing benign neurofibromas, and in addition, intensity of metabolic activity on serial imaging, can also be used for prognostication. Ribet ME, Cardot GR. Neurogenic tumors of the thorax. Ann Thorac Surg 1994;58:1091-5. Reed JC, Hallet KK, Feigin DS. Neural tumors of the thorax: Subject review from the AFIP. Radiology 1978;126:9-17. Cardona S, Schwarzbach M, Hinz U, Dimitrakopoulou-Strauss A, Attigah N, Mechtersheimer section sign G, et al. Evaluation of F18-deoxyglucose positron emission tomography (FDG-PET) to assess the nature of neurogenic tumours. Eur J Surg Oncol 2003;29:536-41. Kumar AJ, Kuhajda FP, Martinez CR, Fishman EK, Jezic DV, Siegelman SS. Computed tomography of extracranial nerve sheath tumors with pathological correlation. J Comput Assist Tomogr 1983;7:857-65. Warbey VS, Ferner RE, Dunn JT, Calonje E, O'Doherty MJ. 18F FDG PET/CT in the diagnosis of malignant peripheral nerve sheath tumours in neurofibromatosis type-1. Eur J Nucl Med Mol Imaging 2009;36:751-7. Ferner RE, Lucas JD, O'Doherty MJ, Hughes RA, Smith MA, Cronin BF, et al. Evaluation of (18) fluorodeoxyglucose positron emission tomography ((18) FDG PET) in the detection of malignant peripheral nerve sheath tumours arising from within plexiform neurofibromas in neurofibromatosis 1. J Neurol Neurosurg Psychiatry 2000;68:353-7. Solomon SB, Semih Dogan A, Nicol TL, Campbell JN, Pomper MG. Positron emission tomography in the detection and management of sarcomatous transformation in neurofibromatosis. Clin Nucl Med 2001;26:525-8.